Eczema, also known as dermatitis, is associated with redness, itchiness and inflammation of the skin. The causes of eczema include other health conditions, irritants, genetic factors and allergies. Atopic dermatitis, the most common form of eczema, is associated with allergies. It often occurs in infants and children. Some supplements may help ease eczema symptoms. Consult a qualified health care professional if your skin condition is severe or persistent. In her book "Prescription for Nutritional Healing," nutritional consultant Phyllis Balch recommends vitamin C with bioflavonoids, a vitamin B complex, vitamin D and vitamin E for people with eczema. Vitamin C with bioflavonoids is a powerful antioxidant supplement that helps stabilize cell membranes and prevent inflammation. The vitamin B complex is essential for the health of the skin and the circulatory system. Vitamin D, synthesized in the body upon sun exposure, helps heal damaged tissues, while vitamin E helps ease dryness and itching. The use of these vitamins is not an adequate substitute for advice and treatment from a qualified health care provider. A review in the "American Journal of Clinical Nutrition" states that results from a number of studies suggest that gamma-linolenic acid (GLA) is useful in relieving eczema symptoms. This essential fatty acid, naturally present in many plant-based oils, is available as a standalone supplement. It is also abundant in the herbal supplements borage oil, evening primrose oil and black current oil. Some researchers believe that eczema might in part be caused by abnormalities in essential fatty acid metabolism. More research is necessary before GLA supplements can be widely recommended. Probiotics are foods or supplements that contain live organisms. Familiar probiotic foods include yogurt and sauerkraut. Probiotics may help strengthen the immune system and mitigate the allergic reactions that sometimes cause eczema flare-ups. Research studies on probiotics for eczema have yielded mixed results. Ask a qualified health care practitioner whether probiotics are appropriate for your condition. Fish oil inhibits leukotriene B4, a fatty molecule of the immune system associated with the inflammation seen in eczema. 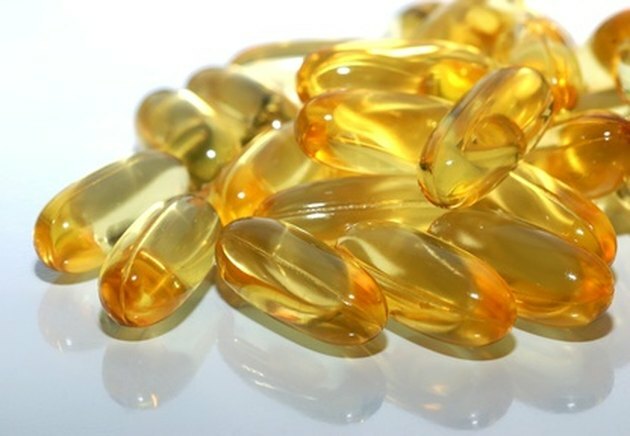 According to the University of Maryland Medical Center, a preliminary study of fish oil in eczema patients found that symptoms significantly improved after 12 weeks of treatment with daily fish oil supplements. The omega-3 fatty acids found in fish oil also benefit psychological and cardiovascular health. Use fish oil under the supervision of a qualified health care professional.